Is this the start of a fourth industrial revolution? 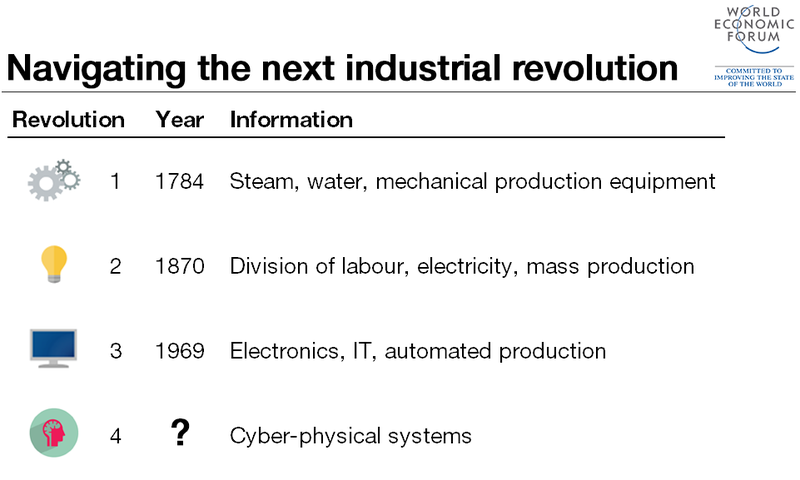 Are we on the cusp of a fourth industrial revolution? Many experts seem to think so. In fact, at this week’s Annual Meeting of the New Champions, some even suggested we’re already living through it. “It’s not the next technological revolution – it’s already here,” said Klaus Schwab. As with the three industrial revolutions that came before, this is about more than fancy new technology. The Spinning Jenny of the first industrial revolution didn’t just make it faster and easier to produce textile products – it fundamentally altered the Western world’s social landscape, from one dominated by small, rural craftsmen to one of factory workers and machine manufacture. The third industrial revolution wasn’t just about personal computers and mobile phones – research shows it increased the amount of time children spent studying and professionals spent working, breaking down the age-old barrier between public and private life. Similarly, the fourth industrial revolution will transform everything from how we learn, work, live and socialize, to the way we see the world and our role in it. What distinguishes this revolution from those of the past is its scale and speed. With previous industrial revolutions, change came slowly, sometimes leaving entire countries and continents unaffected. Not this time. Technologies that just yesterday were limited to the realm of science fiction are now a reality, and they’re transforming the lives of people from London to Luanda. But while history has taught us that this revolution will bring great opportunities – to boost global trade, lift people out of poverty and topple despotic regimes – it will not be without its challenges. The best way to prepare for these challenges is to seek to understand what lies ahead. A new report, Technology Tipping Points and Societal Impact, drew on the collective knowledge of 800 technology executives and experts to predict how this fourth industrial revolution will play out in the next 10 years through 21 trends. Over 80% of those surveyed predicted that by 2025, 90% of us will be using smartphones. As many of us have grown used to owning a smartphone – 50% of people will have one by 2017 – we often forget that the tiny device sat in our pocket has more computing power than the “supercomputers” once big enough to fill a room. The smartphone trend is not one limited to developed countries – in Kenya last year, 67% of handset sales were smartphones, and it’s been predicted that sub-Saharan Africa will have over half a billion smartphone users by 2020. 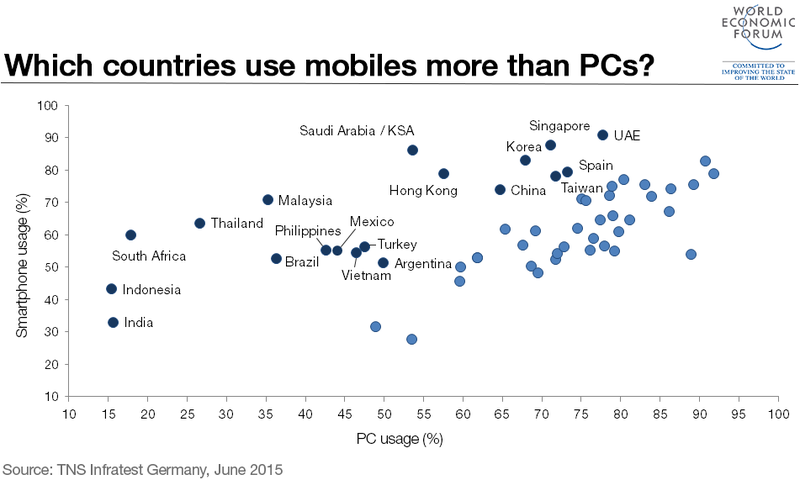 The graph below provides an overview of the countries that are already well on their way to becoming mobile-first. 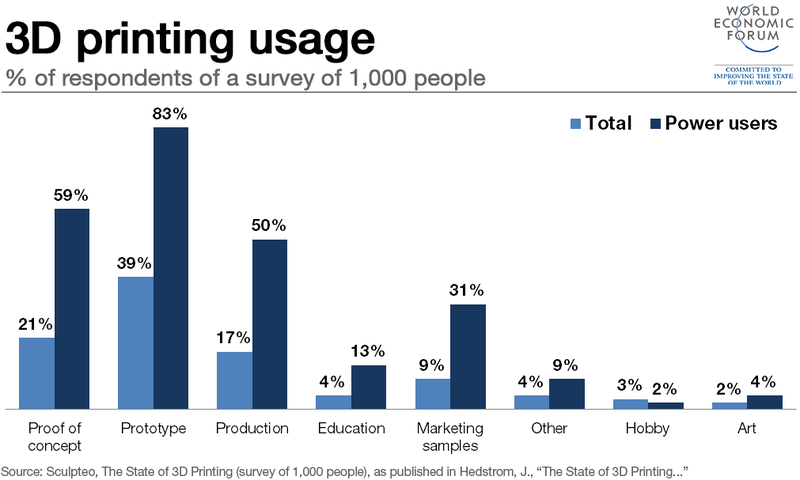 The same percentage of respondents said that by 2025, 5% of consumer goods will be produced using 3D printing technology. This will have huge implications for supply chains – if a product can be made anywhere and by anyone with a 3D printer, a world where consumers can print something in their home on demand does not seem unrealistic. So-called “power users” are already making full use of this technology; a look at how they’re doing so provides a glimpse into a future where 3D printing is commonplace. In 1972, Zhou Enlai, China’s premier at the time, was asked his opinion on the student revolutions that swept across France in 1968: “It is too early to say,” he replied. The fourth industrial revolution is in its infancy, and it is far too early to predict what form it will take. But the more we can understand its nature and causes, the more likely we are to reap the benefits and minimize the risks. Image: A robotic tape library used for mass storage of digital data is pictured at the Konrad-Zuse Centre for applied mathematics and computer science (ZIB), in Berlin August 13, 2013. REUTERS/Thomas Peter.